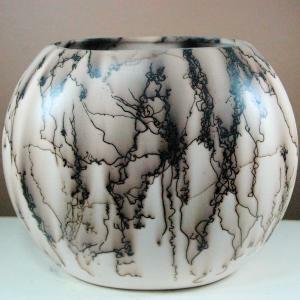 Horse hair pottery is a method of decorating ceramic pottery using the mane and tail hair of horses. Typically a low fire clay is used to create the vessel or shape to be decorated. It is removed from the kiln around 1300 degrees Fahrenheit and the horse hair is applied to the piece. At this temperature the horse hair immediately combusts and is infused into the ceramic. 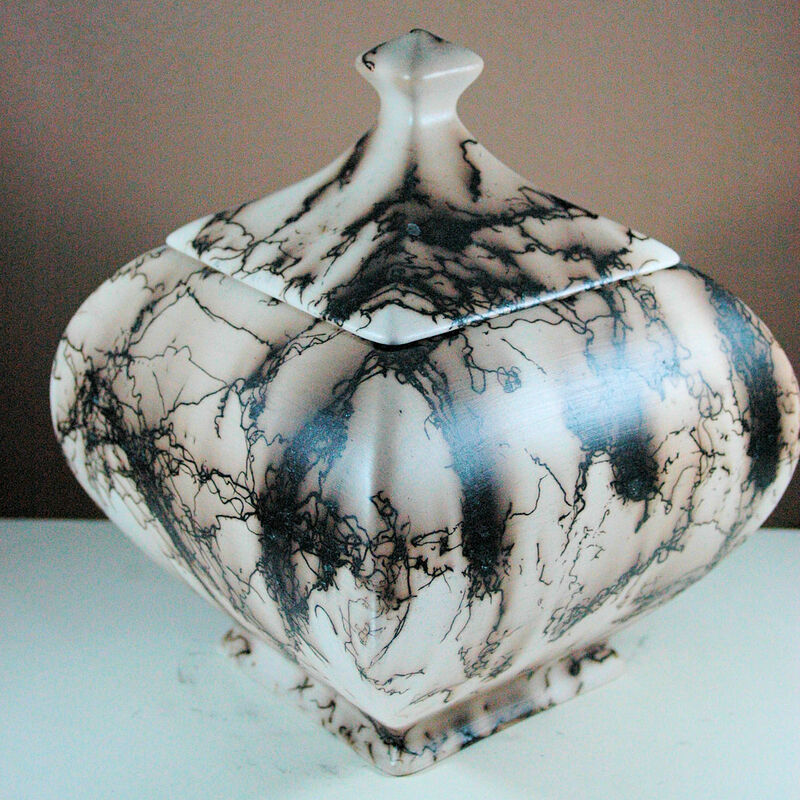 Each piece of hair actually squiggles around like it has a life of its own as it infuses into the ceramic vessel. 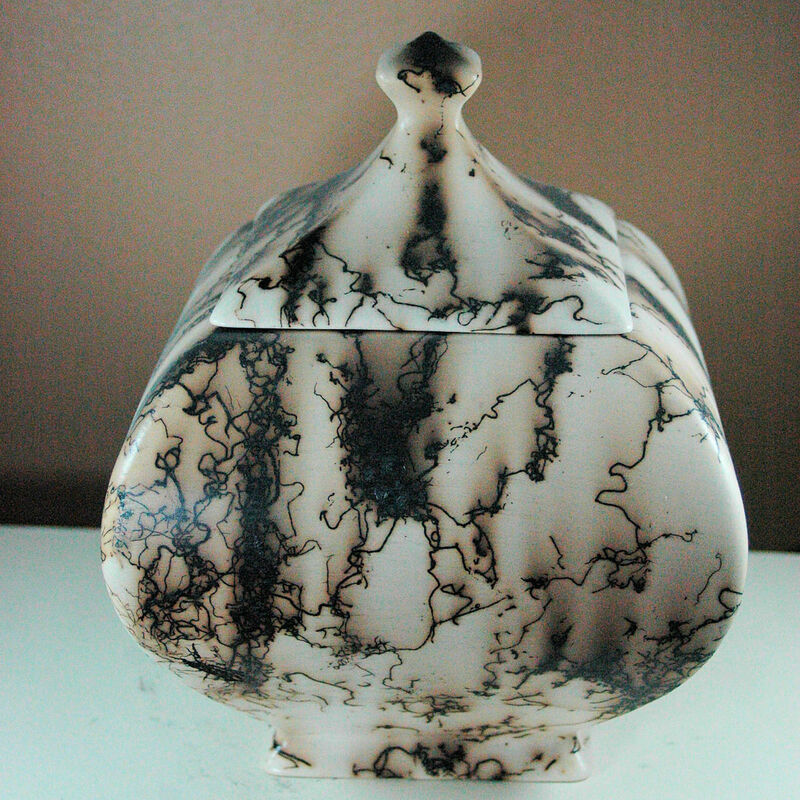 The pattern that each piece of hair creates, as it infuses itself into the ceramic is completely unique. 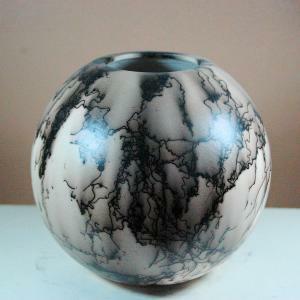 This makes every piece of horse hair pottery completely unique and impossible to replicate. It should be noted that horse hair vases are for decor only. They should not be filled with water as the low fire clay used is very porous and the absorbed water will weaken the vase. The inside of the vase will need to be sealed in order to safely fill the vase with water. This can be accomplished using a product like Thompson’s water seal. Pour about 1 cup of the sealer into the vase and rotate the vase so as to completely cover the whole inside. Pour the excess sealer out and allow a few hours for the sealer to setup. Wipe any excess sealer off the rim of the vase. Repeat the process 1 or 2 more times making sure to seal the entire vase. The origin of horse hair pottery is not known for sure but there is a story of a Native American Pueblo women that accidentally created the technique. As she was removing clay pots from her kiln the wind blew her hair and it came into contact with the hot pot. The hair created a pattern on the pot. This intrigued the women and from then on she tried using other materials such as straw, feathers and horse hair. 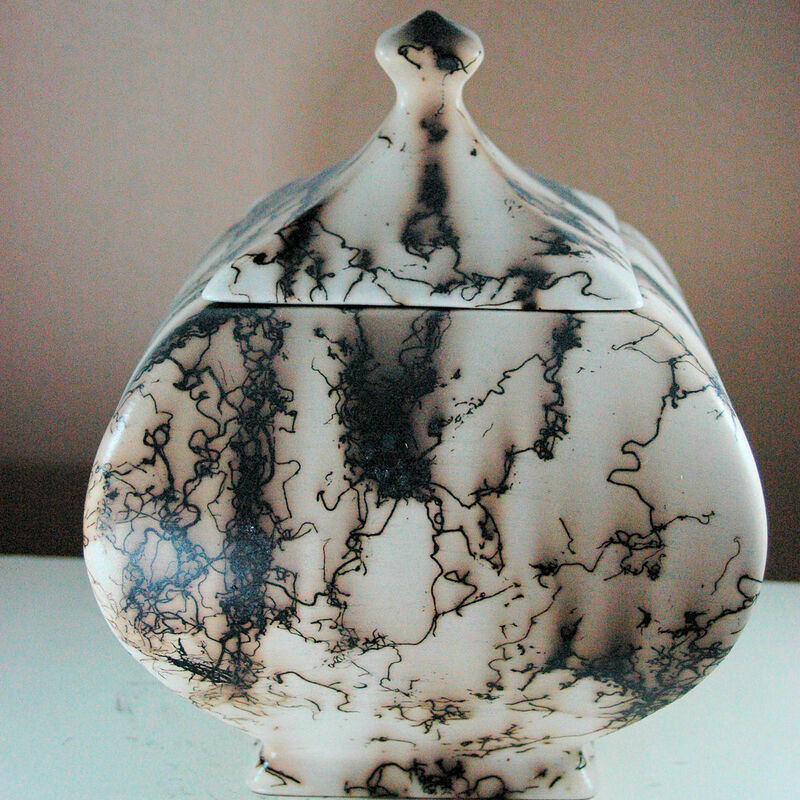 The horse hair created the most dramatic patterns and thus horse hair pottery was born. Another story tells of Native Americans creating horse hair pottery as a way to honor and immortalize some of their greatest horses. 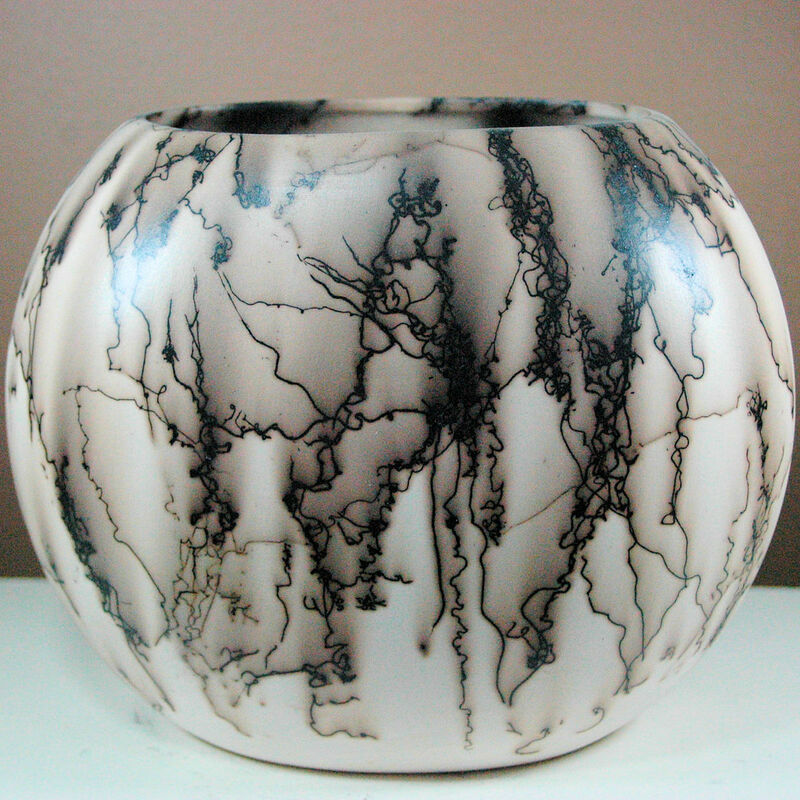 Regardless of it’s origin, every piece of horse hair pottery is a unique piece of artwork that can never be replicated. Below are some pieces of horse hair pottery that we have created in the past. We will be adding more and more photos as time permits. If you would like to see what horse hair pottery we currently have for sale, click this Shop Now link.